How better to enjoy the summer than spending a day outside, listening to great music with your friends. Festival season has started and therefore there are plenty to choose from. Our intern Laura has selected the festivals around the country that she feels shouldn’t be missed. Life Festival has become one of Ireland’s biggest and best festivals for electronic music. The Life Festival is taking place at the beautiful surroundings of the Belvedere House. Stay in our Dublin International Youth Hostel and then take the shuttle bus leaving from the city centre to the festival. The shuttle buses are organised by the Life Festival. For the 8th time Dublin city centre’s multi-stage music and arts festival, Forbidden Fruit is coming back. During the June bank Holiday, you can enjoy 6 stages of different styles of music, suiting all tastes. Do not forget to check out the festival after-parties in official locations around Dublin running until 3am over the three nights of the festival. This festival is all about the experience and not only a gig – As they are saying themselves they are sustainability conscious, without being too-in-your-face; unique rather than boutique. We are an independent festival with a heart-shaped mind and a cutting-edge soul. What sounds better than celebrating the beginning of summer? 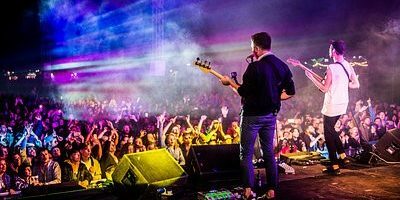 Sea Sessions is one of Ireland’s most highly respected small festivals and is widely recognised as being country’s premier music, camping and surfing lifestyle event. Sea Sessions is only half an hour drive from our Blue Stack Centre Hostel in Donegal. After plugging out last year’s BARE17 festival just weeks before the event, they are back again this year. This year BARE will take place at Borris House in Co. Carlow. The Groove Festival at the Killruddery House in Bray is not only fun for families and young kids. They have a cool line up with the best new music around. Groove Festival organises shuttle buses from the Killruddery House to the Bray Dart station. Stay in our Dublin International Youth Hostel and get the Dart from the city centre to go directly to the Bray Dart Station. With J. Cole, Travis Scott and Solange as the main acts during the Longitude weekend in Marlay park, you definitely do not want to miss this festival. Since there is no camping on this festival, the best place to stay is our Dublin International Youth Hostel. Shuttle buses can take you from the city centre to the Marlay Park or take the Luas which will bring you close to the entrance. This three-days festival is taking place near Cork’s old Rusheen Farm estate. Here you can enjoy all music genres, including everything from acoustic to electronic, reggae, folk and hip hip. Besides the music, Townlands Carnival is also focussing on imagination and creation and they are huge on the environment. KnockanStockan is a 2-day camping festival “by musicians, for musicians” in Wicklow. Looking at their Facebook, their mission is to bring musicians together to celebrate, showcase and share their music with like-minded people. Make the most out of it and stay a bit longer to check out the beautiful Wicklow Mountains and stay in one of our three hostels in Wicklow, The Knockree Hostel, The Glendalough Hostel or the Glenmalure Hostel. A completely new festival this year is the All Together Now festival. This festival takes place at the Curraghmore House in Co. Waterford. Stay on their campsite or check out our Beach Haven Hostel only a half hour drive from the Curraghmore House. Castle Palooza is a boutique music and art festival at the Charleville Castle in Tullamore. Cool fact about this festival is that they are joining with Festival Vision 2025 to reduce their environmental impact. It is their goal to become Ireland’s most environmentally friendly festival. This festival is not only about good music, it is including a great Eatyard, Studioyard and a Gamesyard. The Beatyard is taking place at the Dun Laoghaire Harbour and is kicking off on Friday with the Jackson’s playing their first ever Irish show. Indiependence is a weekender festival which takes place each year during the August Bank Holiday weekend. It has a wide variety of artists as well as other attractions. Indiependence is teaming up this year with GoCarShare as part of making the festival as green as possible. Stay in our Sheilas Hostel in Cork City and drive together to Mitchelstown, where the festival is taking place. A great way of making new friends, saving the planet a little and to save money! Electric Picnic is a three-day arts-and-music festival which has been held in Stradbally, Co. Laois, since 2004. This year great artist such as Kendrick Lamar, N.E.R.D, Dua Lipa, Ben Howard and St. Vincent and many more will perform.